I have heard it said many times that real men wear kilts, so what do people mean when they say that? Well what I personally take that statement to mean, is that men who are self assured, confident, and who like to stand out from the crowd, can often be found wearing kilts. Kilts are after all, the most masculine garment imaginable, and women find men in kilts almost irresistible (if not totally). When you wear a kilt you turn every occasion into a special occasion. Complete strangers have come up to me while I have been wearing my kilt, and started conversations, do you know of any other garment that can break the ice the way a kilt does? 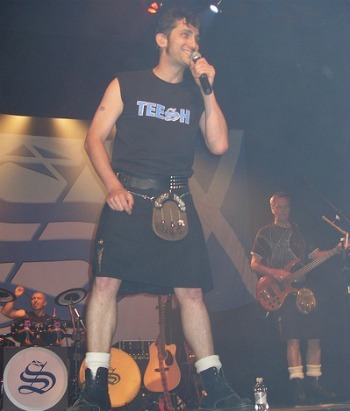 Members of rock groups have taken to wearing kilts on stage, as you can see in the following photo. It shows Ian Scott, lead singer with the band Scocha, having a blast on stage at the Royal Theatre Dumfries, Scotland. As you will notice, other members of the band behind him are also wearing kilts. And real men who wear kilts don't have to be Scottish or Irish, in fact there are many thousands of men, in different countries across the world who don't have any Celtic heritage whatsoever. Nonetheless they find wearing kilts, comfortable, elegant, practical, and totally masculine. Scottish athletes who compete in Highland Games, do so in kilts. 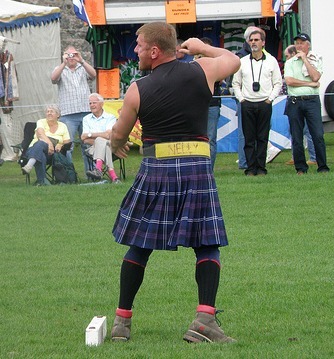 Below you can see a photo of the Scottish Champion Neil Elliot from Helensburgh, competing in the Scots Hammer Throw at the Peebles Highland Games. Does it take courage to wear a kilt? No, just a strong sense of your own self, and I can assure you your self esteem will increase every time you wear a kilt in public. 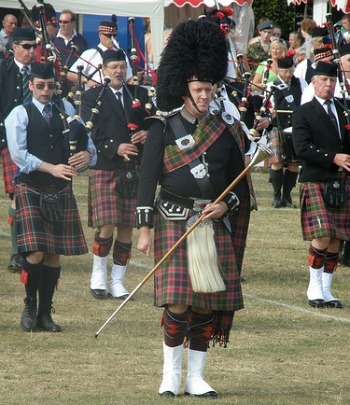 Pipe bands of course are famous for wearing kilts, and these real men wear kilts partially as a symbol of Scottish tradition. Pipe bands just like the kilts they wear, have their roots firmly anchored in the Scottish Military. And we have these former Scottish Regiments to thank for the blood stirring spectacle of the pipe bands, and indeed for the kilt itself. Kilts are far more suited to the male anatomy than trousers (pants) could ever be. When is the last time you sat down in a pair of jeans, without feeling constricted around the groin area? That doesn't happen in a kilt. In fact, in a kilt you experience a total sense of freedom whenever you walk or sit down. That leads into the most frequently asked question I have ever heard about the garment. What is worn beneath it? The answer to that lies entirely with the individual, I would say that in Scotland real men wear kilts traditionally without underwear. 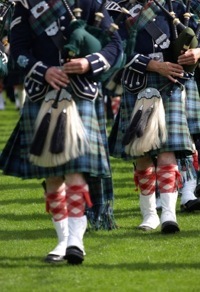 This tradition began with the military, and was quickly adopted by most Scotsmen in civilian life also. I personally have never worn anything below my kilt, other than my kilt hose, Sgian Dubh, and kilt shoes. For those of you who would like photographic evidence of what a Scotsman wears under the kilt, simply follow the link to that page. I trust this page has given you an incentive to go out and wear a kilt, if you have never done it before, and to experience the total sense of liberation that only a kilt can deliver.